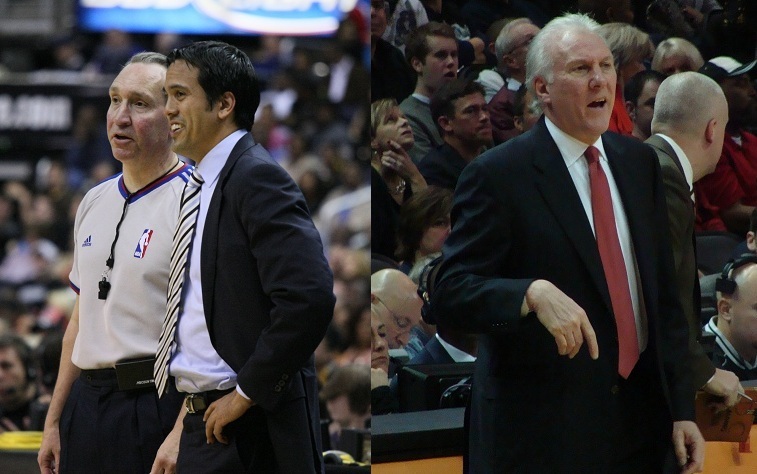 The 2013 NBA Finals could come down to coaching. Is it just me or did we take the circuitous route and end up at the same point we all thought we would end up at from the beginning of the season? The Heat are taking on [insert strong Western Conference Champion here] for the NBA Championship. Yawn. Right? We might have squabbled about which team would represent the Western Conference – I picked the Lakers and was very happy to be wrong. My second pick would have been San Antonio, and the popular pick seemed to be Oklahoma City. But we all knew we were basically going to end up with an iconic Heat-Somebody matchup. Either the storied, star-studded Lakers, the up-and-coming star-studded Thunder, or the Old Guard of the Spurs. November 29, 2012: Miami 105, San Antonio 100 – Parker, Duncan, Ginobili, and Green get sent home before the game to rest following a grueling road trip, Popovich gets fined $250,000 for not disclosing alternate travel plans for the absent players. That last time the two teams played with both “Big Three” units intact was March 14, 2011. 27 months ago. The cherry on top – Richard Jefferson and Erick Dampier were in the starting lineups that night. This series is basically a blank slate. We don’t have very much to point to as concrete evidence of an upper hand either way. But that doesn’t mean we can’t try anyway. In keeping with my previous three Finals previews, I have organized this based on which team has the ball. Reductive to an almost stupid level? Sure. Still true? You betcha. I have a groundbreaking opinion, and I hope you guys are all sitting down for this, but having LeBron James on your basketball team is a generally positive experience. He’s really good at basketball. Given the series he just had (29/7/5, .510 FG%, .441 3PT%) against Indiana, the best defensive team in the league, I can’t imagine he would be too different against San Antonio. The Spurs defense against LeBron is going to be a lot like Indiana’s, only all the pieces involved will be slightly worse. Kawhi Leonard isn’t as disruptive as Paul George, and Tim Duncan doesn’t patrol the paint and seal off the front of the basket with the same authority that Roy Hibbert did. Don’t get me wrong – Duncan is a better overall defensive player than Hibbert is – Duncan rotates better, is smarter in play recognition, and moves better in space; but when it comes to defending LeBron on a straight line drive to the rim, Hibbert’s extra size is a big deterrent that Duncan can’t totally replicate. San Antonio’s offense also helps Miami’s in a slightly roundabout way – Shane Battier and Ray Allen should see more minutes in this series because they match up better with their San Antonio counterparts than they did with Indiana in the Eastern Finals. Battier got abused by David West to the point where he only played a combined 13 minutes in games 6 and 7. Against the Spurs, who will likely give a decent amount of run to Matt Bonner, Battier’s lack of size shouldn’t be an issue. As for Ray Allen, who displayed a shocking inability to guard anyone in a Pacers’ uniform, should have an easier time against Danny Green and Gary Neal, who aren’t real off-the-dribble threats like Lance Stephenson. Miami’s best bet on offense is to basically play the same way they did against Indiana. The Pacers and Spurs have similar defensive philosophies, Indiana is just better because they have more size across the board (most notably in the backcourt). Considering Miami didn’t really have much trouble scoring against Indiana (with the obvious exception of Game 6), running basically the same action against San Antonio should provide similar results. They also might be able to get a few hints from last year’s Western Finals when Oklahoma City continually forced Boris Diaw and Tiago Splitter into compromising defensive situations and took full advantage of it (especially in Game 4, an absolute bloodbath). Miami might be able to pull a copy-cat move with the pin-down play that Oklahoma City tore the Spurs asunder with. The Duncan-Hibbert comparison is a tough one to totally get a grasp on. If Duncan can even slightly reproduce the effect that Hibbert had on Miami players going to the basket (i.e. generally preventing them from attempting shots around the basket in the first place), that’s a huge coup for the Spurs, because Duncan is so much better rotating to help and as an overall defensive communicator. That set Miami ran with Birdman cutting in behind Hibbert for easy dunks after Hibbert committed to LeBron? It’s going to be a lot tougher to run effectively against San Antonio’s defense. As mentioned above, San Antonio doesn’t have the same athletes on the perimeter that Indiana did, but they’ll have the advantage of coming into the series knowing that Wade and Bosh are seriously struggling. That might have altered their preparation, and we could see them selling out to stop LeBron in Game 1. Gregg Popovich is well-known as an outside-the-box thinker, so we could see some interesting looks defensively from the Spurs. Maybe even some zone like Dallas did in 2011 (which clearly flummoxed LeBron), although I’m dubious it would be as effective since Miami has added Battier and Allen. In last year’s Finals, Miami was able to effectively bottle up Oklahoma City’s pick-and-roll game for one simple reason (and I’ve written about this before): Oklahoma City needed to be able to create north-south lines to the basket off high pick-and-rolls (Westbrook and Harden especially), but Miami completely cut off those creases by forcing every high screen towards the sideline. It’s Chris Bosh’s biggest defensive strength. Against San Antonio though? I’m not sure that works. Obviously you don’t want to give Tony Parker or Manu Ginobili straight line drives at the rim, but stringing them out to the sideline or trapping off the screen probably isn’t the best idea, either. As often as not, that’s going to lead to the Spurs swinging the ball back around and ending up with a wide-open corner three on the weak side. Those are the plays that the Spurs live on. The defense thinks they have them bottled up until the defense realizes that the ball moves faster than they do and all of sudden they gave up three points. Also, like Indiana, the Spurs are much bigger than Miami is. When you compound that with their dynamic pick-and-roll game, we might actually see (gulp) Joel Anthony in non-garbage minutes (I swear to God I’m only like 12% joking when I say that). Granted, there is a philosophical difference in this area between San Antonio and Indiana – the Pacers won’t hesitate to crash the boards looking for 2nd shot opportunities, but the Spurs care a lot more about floor balance and not giving up easy points in transition. You can see this by looking at their Offensive Rebound Rates. Indiana was 4th in the league, rebounding 30.3 percent of their own misses. San Antonio was 29th at 20.5 percent. It will create a classic catch-22 for the Spurs – do they take advantage of Miami’s poor defensive rebounding, or do they try to avoid the Miami Transition Flying Death Machine (pictured below)? My guess is that they will play it conservatively, but they still should have an edge there if they want it. Lastly, the Spurs can always go to their “abuse the opponent’s worst defensive hole” gameplan, one that has worked wonders for them over the years. Gregg Popovich is a savant. It is effectively impossible to hide a defensive weakness from him. In this series, it’s Ray Allen. He can’t really guard anyone, so long as that person is capable of dribbling the basketball twice consecutively without falling down. It was on full display in the Indiana series – even Sam Young dunked on him. Against the Spurs, Allen will spend most of his time defending either Danny Green, Gary Neal, or (gulp) Manu Ginobili. By the sheer grace of God, he might be able to hide against Green and Neal. He has no such hope if Ginobili is on the floor (it’ll be even worse when the Spurs play Parker, Ginobili, and Leonard together – in other words – crunch time). Popovich will find a way to attack him and then beat him with a lead pipe until either (1) they win the series, or (2) Spoelstra has no choice but to sit Ray Allen. Either way it’s a positive for San Antonio. As mentioned above, the ball moves faster than the defense does. Miami’s defense can scramble in apparent chaos better than any other defense in the league (only Chicago and, surprisingly, Washington come close). Defenses like Indiana and Memphis are built on discipline – force the offense towards defensive help and hope they miss a contested shot. Having condor-like length doesn’t hurt either. But when you have athletes like LeBron, Wade, and Bosh (or Noah/Gibson/Deng or Wall/Ariza/Beal – just don’t ask), you can force the offense towards help and hope they miss a contested shot but if that doesn’t work scramble like hell and still force a bad shot. It’s really incredible to watch. That’s really their only hope to get consistent stops in the series – be so ridiculously athletic that you can negate San Antonio’s offensive precision. Also, as mentioned above, LeBron James is good at basketball. Miami knows that somewhere in their back pocket, they can unleash LeBron on Parker or Ginobili if they become too difficult to defend for [insert overmatched Miami backcourt player here]. They did it against Derrick Rose in the 2011 Eastern Finals, they did it against [insert hot Oklahoma City perimeter player here] in the 2012 Finals, and they did it for spells against Paul George in this year’s Eastern Finals. 1. LeBron is Miami’s trump card. Being smarter, more precise, and more disciplined is San Antonio’s trump card. You pick. 2. Gregg Popovich is the best coach in the NBA. Erik Spoelstra is probably the most underrated coach in the NBA. I almost want to watch footage of the coaching staffs breaking down game tape as much as I want to watch the actual games. 3. Miami has home-court advantage. Since the NBA Finals switched to the 2-3-2 format (in 1985), there are as many instances (three) of the ROAD team sweeping all three games in the middle as there are of the home team sweeping all three in the middle. Detroit swept Portland’s three home games in 1990, Chicago did the same to the Lakers in 1991, and the Lakers did it to Philadelphia in 2001. Meanwhile, Detroit swept all three at home against the Lakers in 2004, and Miami did it against Dallas in 2006 and Oklahoma City last season. In other words, it’s pretty hard to win three games in a row, even at home. This means the team with home-court advantage tends to have a bigger leg up than the obvious “four home games to three.” Miami has home-court advantage. But they also blew home-court advantage in 2011 (losing TWO games at home). Basically I have no idea. That’s my expert opinion. 4. This series will be a shootout. I don’t think either team is well-equipped to guard the other, but that could be because there really aren’t any teams in the league well-equipped to guard these two teams. You could assemble a defensive Dream Team of the eliminated 28 teams (how does Marc Gasol, Joakim Noah, Paul George, Tony Allen, and Avery Bradley strike you?) and they’d still probably have trouble defending these guys. Miami was better offensively in the regular season, and better offensively in the playoffs (despite playing better defensive teams in every series than San Antonio). Then again, San Antonio was better defensively in the regular season, and has been better defensively in the playoffs (again, despite playing better offensive teams in each series). Again, I have no idea. That’s my expert opinion. Before the season started, I picked Miami to win the NBA title. That makes me think I should stick to my guns. Of course, I picked them to beat the Lakers, which makes me think I should let Obama take away my guns like he so obviously is going to do (sarcastic political joke – internet high five!). It’s going to sound like a ridiculous cop-out (even more so because it took me almost 2400 words to get here), but I’m going to roll with Miami because of home-court advantage. These teams just match up so evenly – Miami (probably) has more talent but their tendencies play right into San Antonio’s strengths. So Miami has four home games, San Antonio three. And if history is any lesson, San Antonio won't win all three at home.